nCmd is an xBase compatible application development environment. Port existing Fox/Clipper/dBase applications, or develop new applications to exploit the full power of Windows NT/95/98, QNX 4 or OS/2. Use industry-standard DBF technology, or our unique integration to SQL, including support for index expressions. Automatically create GUI applications from old applications, or extend applications with built-in multimedia, Internet/TCPIP, event programming, DDE, DLL, and many other extensions. OnCmd supports an extensive Visual development environment including a report generator, project manager, screen painter/application generator, and database maintenance utilities. All of which were written using only OnCmd. OnCmd is a high-level programming language that extends xBase with a very rich set of operators, structures, commands and functions. A super fast compiler, linker and interactive runtime debugger are the core of the product. Business application development is under constant pressure from users, management, constrained development resources, and even technology (choosing the best software and hardware for design, development, and deployment). On top of that youve got the dreaded Y2K (Year 2000) problem looming. Many of your departmental and even core business applications were written in Fox, dBase, or Clipper and have been running for as long as 10 years. Up to now, youve had two choices. Rewrite the apps from scratch in a new language (once youve figured out which one to use), or buy a packaged solution and hope it supports your core business logic (or that the users will accept the new applications philosophy). 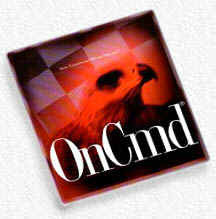 OnCmd now provides you a real alternative. Port your existing applications to OnCmd and retain your core business logic which has taken years to develop, debug, and refine. Reduce your efforts in re-building, re-engineering, and re-testing. Capitalize on new technology platforms like OS/2, NT, and Windows 95/98. Automatically achieve GUI mouse-driven applications from your old text-based xBase apps. Get 32bit execution and memory performance. Use scaleable DB2 or SQL engines for your back end data storage. Add buttons, toolbars, and other extensions. In short, breathe new life into your legacy applications.